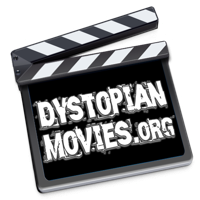 Here are the dystopian movie reviews. Metropolis is the classic silent-movie industrial dystopia from 1927. It portrays a futuristic city comprising a two-tier society of haves and have-nots who are kept unaware of each other's existence. Gustav Frohlich as Freder in Metropolis: "I wanted to look into the faces of the people whose little children are my brothers, my sisters... Your magnificent city, Father - and you the brain of this city - and all of us in the city's light... And where are the people, father, whose hands built your city ---?" Brigitte Helm as Maria in Metropolis: "HEAD and HANDS need a mediator! The mediator between HEAD and HANDS must be the HEART!!" Alfred Abel as Joh Fredersen in Metropolis: "Beginning today, I wish to be kept informed of every step taken by my son." V For Vendetta is set in a near-future totalitarian British state. Starring Hugo Weaving as the masked character 'V', and Natalie Portman as Evey Hammond. Hugo Weaving as 'V' in V For Vendetta: "People should not be afraid of their governments. Governments should be afraid of their people." Natalie Portman as Evey Hammond in V For Vendetta: "Artists use lies to tell the truth, while politicians use them to cover the truth up." John Hurt as Adam Sutler in V For Vendetta: "I want this country to realize that we stand on the edge of oblivion. I want everyone to remember why they need us!" A Clockwork Orange is a brutal Stanley Kubrick film, based on the Anthony Burgess novel. In the near future society is in decay, and the streets are overrun by violent gangs. The government has a new heavy-handed test project, designed to re-program these renegades, in order to free up the overcrowded prisons to make space for political prisoners. Malcolm McDowell as Alex in A Clockwork Orange: "What we were after now was the old surprise visit. That was a real kick and good for laughs and lashings of the old ultraviolent." Aubrey Morris as Deltoid in A Clockwork Orange: "What gets into you all? We study the problem. We've been studying it for damn well near a century, yes, but we get no further with our studies. You've got a good home here, good loving parents, you've got not too bad of a brain. Is it some devil that crawls inside of you?" Anthony Sharp as Minister of the Interior in A Clockwork Orange: "Public opinion has a way of changing." The Dark Knight Rises completes Christopher Nolan's Batman trilogy. Christian Bale as Bruce Wayne in The Dark Knight Rises: "I do fear death. I fear dying in here while my city burns." Anne Hathaway as Selina Kyle in The Dark Knight Rises: "Do you think this is gonna last? There's a storm coming, Mr. Wayne. You and your friends better batten down the hatches, because when it hits, you're all gonna wonder how you ever thought you could live so large and leave so little for the rest of us." Tom Hardy as Bane in The Dark Knight Rises: "Gotham, take control… take control of your city. Behold, the instrument of your liberation! Identify yourself to the world!" Fahrenheit 451 is an adaptation of the novel of the same name, by Ray Bradbury. It is a tale of an oppressive future where books are blamed as the unsettling force that makes people discontent with their lot, and undermines the stability and smooth running of society. So the books have to be burned. Cyril Cusack as The Captain in Fahrenheit 451: "Listen to me, Montag. Once to each fireman, at least once in his career, he just itches to know what these books are all about. He just aches to know. Isn't that so?" Oskar Werner as Montag in Fahrenheit 451: "Behind each of these books, there's a man. That's what interests me." Julie Christie as Clarisse in Fahrenheit 451: "Is it true that a long time ago, firemen used to put out fires and not burn books?" The Dark Knight Rises completes Christopher Nolan’s Batman trilogy. It is set in the extremely messed-up city of Gotham, which is clearly modelled on the less fictional, but equally messed-up, New York. Metropolis is the classic silent-movie industrial dystopia from 1927. It portrays a futuristic city comprising a two-tier society of haves and have-nots who are kept unaware of each other’s existence. What is The Matrix? The movie explores the nature of reality, in a distant dystopic future in which man’s mechanical creations have been become unmanageably powerful and rebelled against their creators (not unlike The Terminator‘s ‘Skynet’). It follows the path of one man’s quest for the ‘truth’. Stephen Rea as Eric Finch in V For Vendetta: "If our own government was responsible for the deaths of almost a hundred thousand people... would you really want to know?"